Heat oven to 400°F. Spray 8-inch square (2-quart) glass baking dish with cooking spray. In large bowl, mix 3/4 cup sugar and the cornstarch. Add blueberries and lemon juice; mix well. Spoon evenly into baking dish. Remove pie crust from pouch; place flat on lightly floured work surface. Press crust slightly to form square. With pizza cutter or knife, cut dough into 5 rows by 5 rows (2-inch squares). Place individual dough pieces over blueberry mixture, overlapping pieces to completely cover fruit. Sprinkle with 1 teaspoon sugar. Bake 25 to 30 minutes or until crust is golden brown. Cool 10 minutes before serving. Want to make this dessert quickly? 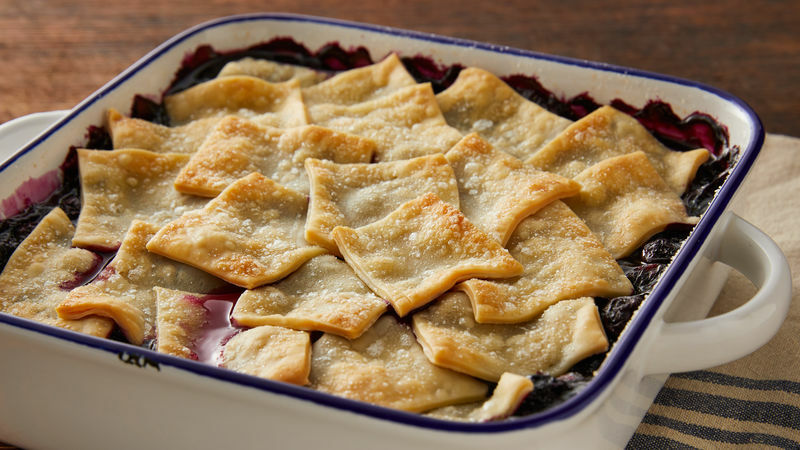 Place unrolled crust on surface; cut into 8-inch square, and place over blueberry filling; cut several slits in crust to vent. To easily make your patchwork crust, use a ruler and mark off the 2-inch squares on the top and one side of crust.